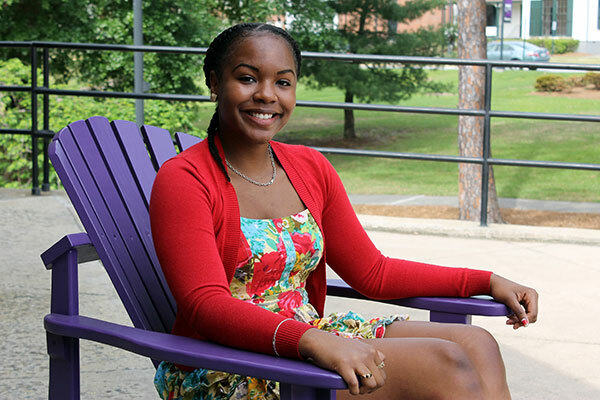 Health Services Administration major Alexis Jackson is a vice president of the Campus Activities Board. Full Name: Alexis S. Jackson. High School: "I went to Cairo High School, where I was active in the marching and symphony band for four years, while being part of our band leadership. I received superior ratings in solo and ensemble. I participated in the art club my senior year and was a member of Key Club my sophomore and junior years." Family: My mother, Shon Jackson; Aunt Carol and the Thomas family; grandmother, Margaret; my two brothers, Bam and D-Tray; my sister, Jenesis; and my spouse, Nate. They play a major part in my life. They help motivate and keep me on the right track." Activities: "I am currently the vice president on the Campus Activities Board (CAB). I've also been selected to serve on the executive committee as publicity chairman." Career Goals: "I would love to be either an executive, manager or supervisor in a nursing home, hospital or any healthcare facility. Helping people and taking care of those in need are things I've been doing in some ways for most of my life. I have a huge heart and a passionate personality, so this would be considered to be my dream job." She chose Middle Georgia State University because … "The campus had everything I was looking for as far as extracurricular activities and sports. It's located in a small town, similar to where I'm from." The greatest thing she discovered about Middle Georgia State was … "The professors are very engaging. They encourage you to stop by if you ever need help with understanding the material. They build bonds with students." Her greatest academic experience so far as a Middle Georgia State student has been … "Being able to apply the things I've learned to everyday circumstances and relationships, thanks to Dr. Thomas Caldwell and Dr. Rebecca Nees." To her, greatness means ... "Staying up late nights repeatedly, accomplishing every task and goal you've set no matter how overwhelming. Finding greatness is simply looking in the mirror at your reflection, smiling because you know you made it." One thing people don’t know about her is … "I did competition cheerleading when I lived in Florida and received two trophies. I continued to cheer again once I moved back to Georgia. Later, I joined the basketball team." The one person she'd most like to meet is … "Whitney Houston. She was and probably still is my favorite singer. If I ever were to become a singer, she would most definitely be my inspiration and influence. Such talent gone too soon." In five years ... "I hope to be financially stable and working in healthcare administration. Who knows? Maybe I'll even have a family of my own."